Exotic color. Organic style. Old world spirit. My name is Sarah, and I am the designer and owner of a world called Vintage Earth, which I operate out of my studio in Southern Maine. I have been designing and selling jewelry for several years, and started Vintage Earth in 2002. Rocks, glass and metal are just a few of my obsessions. I love to mix color and texture, to blend earthy with elegant. I draw much of my inspiration from nature, and I have a particular fondness for old world and Bohemian elements, and often work them into my designs. I love to combine eras and elements, to really mix it up! My work has been featured on many websites, including Bella Online and Style Bakery. I also am a state juried member of the Maine Made program. ​My designs range from the simple strand to pieces with vintage or exotic accents. 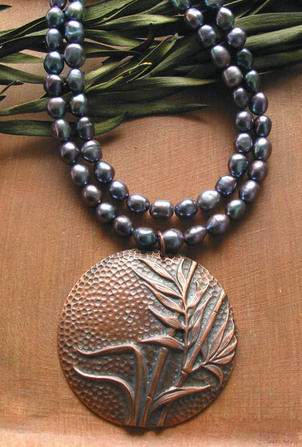 Vintage Earth is modern jewelry with a rich, ancient feel--perfect for everyday wear. While I sell primarily to retail stores, I do offer a select number of items for retail sale. Click on the Shop link to view my items.